It’s victory Monday and we can breath a little for the next two weeks. No better way to go into a bye week than with a commanding victory and coincidentally it’s a great time to sell you guys stuff too! So I just wanted to remind everyone about our big Jets week takeover on Monday Night Football on December 1st! We have nearly 1300 people signed up but only about 600 people have paid. We want to beat our MetLife Stadium group sales record of 761 so if you have signed up get your money in ASAP! If you haven’t signed up do it now! After signing up you will get an email (be patient sometimes it takes a week or more for us to get back to you) with info on how to pay for the tickets. If you have already signed up all the emails should be sent out by the end of today. If you haven’t received an email from us check your spam folder or email dolfansnyc@gmail.com for more info. But don’t bug Michelle she has a full time job and a baby so sometimes it takes a few days to get back to people. You can read this FAQ to answer more questions about the #MetLifeTakeover but here’s some quick info. The tickets are $60 which is lower than face value. We get them for slightly less than that and use the money left over to help fund events and to give to charity. We don’t profit at all off any of this. It’s a labour of love. We don’t like give out what section the tickets are in because we don’t want Jets fans to buy seats around us but they are up top. I know a lot of people don’t love to sit in the upper decks but I assure you sitting with close to 1,000 Dolphins fans is a much more fun experience than sitting front row at the 50 yard line. We also have a bus ticket package where we provide transportation from our bar Slattery’s Midtown Pub but keep in mind that it’s very difficult to park in the city on a Monday night. Also, I wanted to announce that we are going to throw a party the day before the game at Slattery’s. No details yet but it will probably take place around the 4pm games and will be very worth attending. 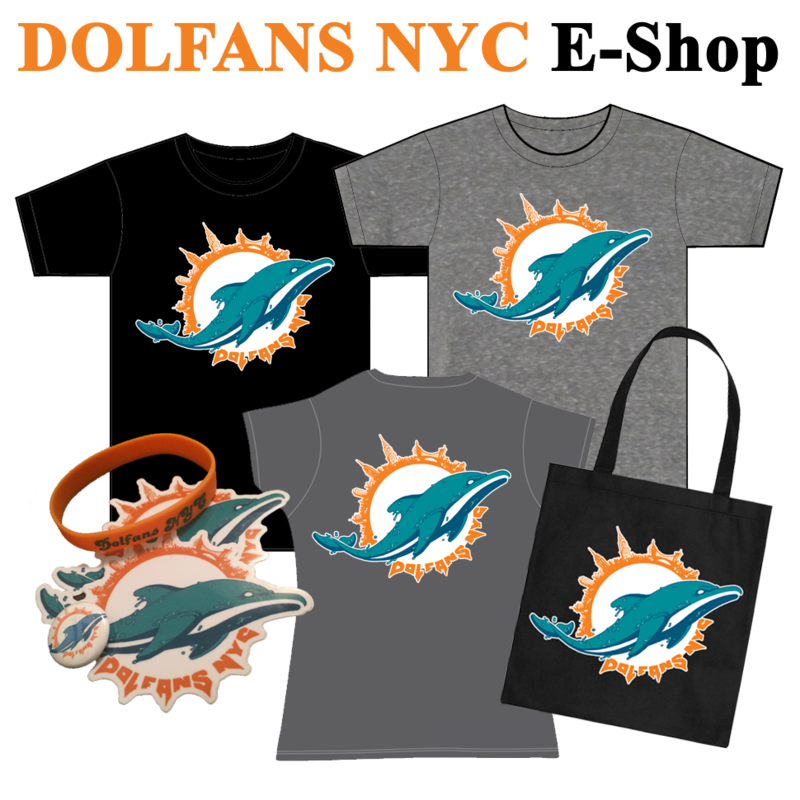 Since we aren’t doing an official tailgate this year, Sunday will be a great opportunity to meet fellow Phins fans from NYC and beyond, buy Dolfans NYC gear and check out some of the serious surprises we have in store. So if you are coming from out of town make sure you plan to be in the city on Sunday! Lastly I wanted to thank everyone who came out to the bar on Sunday. We raised over $400 for Hank the bulldog’s medical bills and another $100 for the no kill animal shelter BARC. Really means a lot that we are able to do that for members of our community. Now enjoy the next two weeks and get ready for a serious test against Aaron Rogers and the Green Bay Packers. Phins up! SIGN UP FOR THE #METLIFETAKEOVER HERE! #MetLifeTakeover Wrap Up & Pictures! Yesterday was one of the best days of my life and I have a feeling that another 750 or so people feel the exact same way after the amazing day we had yesterday at the Meadowlands. We rolled very deep taking four busses of fans from Slattery’s Midtown Pub to MetLife Stadium where a ton more Dolphins fans joined us. As a group we bought 760 tickets but there were a lot more at the game and I feel like most of them came to our tailgate! The tailgate was catered for the first 300 people who signed up but a bunch of people brought their own food and set up around us. We also had beer and rum provided by PBR and Sailor Jerry and I can’t thank them enough for sponsoring our tailgate free of charge. The tailgate featured some Dolfan guests when team CEO Tom Garfinkle and Nat Moore showed up and posed for pictures with fans. While it wasn’t quite the Fergie appearance from last year Sun-Sentinel reporter Omar Kelly showed up and he was voted one of South Florida’s sexiest TV newsmen. (I actually had to google “Omar Kelly sexiest” to find that link. I hope the NSA isn’t judging me.) We also had a pretty awesome performance from Miami Dolfan Music’s own Solo D who recorded a #MetLifeTakeover song for the occasion. The Dolphins sent us a MASSIVE flag that we broke out at the tailgate. I had to climb on top of an RV to get pictures! I was also told Brent Grimes’ hilarious wife Miko showed up to the tailgate late but I missed her. I was running around like a chicken with my head cut off so I barely had time to talk to anyone for more than a minute, but it was really amazing to meet all the Dolphins fans who came from all over the northeast for the game. The York PA Dolphins Fan Club and the Northern VA/DC club made group trips up and I hope it becomes a tradition. I love meeting fan clubs from all over and Michelle and I really want to do what we can to help grow these clubs around the country. 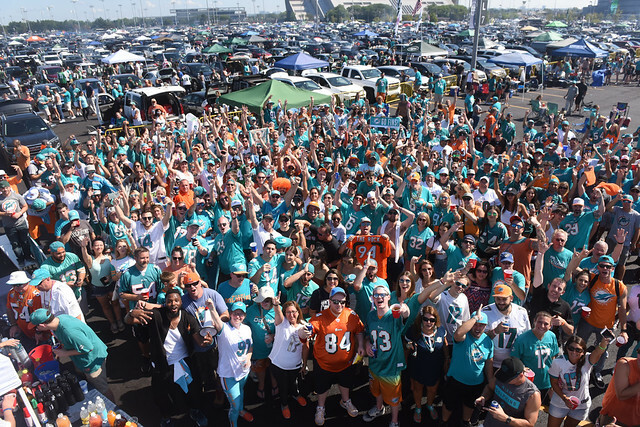 Dolfans NYC has been successful partly because there are more than 10 million people living within an hour of us but I also think some of our marketing efforts have worked pretty well and I hope we can help other clubs do similar events at other Dolphins away games. The game itself was of course amazing and our sections were ROCKING! We gave out 750 rally towels at the tailgate and they were in full force throughout the game. Marv Albert mentioned how loud we were on the TV broadcast after Brian Hartline scored a TD and pointed to our section with the ball. You could hear our LET’S GO DOLPHINS and DEFENSE chants in the background on the telecast but our Seven Nation Army chants were really audible in the fourth quarter. The Jets made a huge mistake by playing the song before a Dolphins third down and we kept coming back to it after that. It was pretty hilarious to use that against them. Aside from the camaraderie and the huge win it was awesome to feel like what you were doing made a difference on the field. I think we all felt like we were making a difference in the game and giving our team energy and I don’t think we were alone in that. 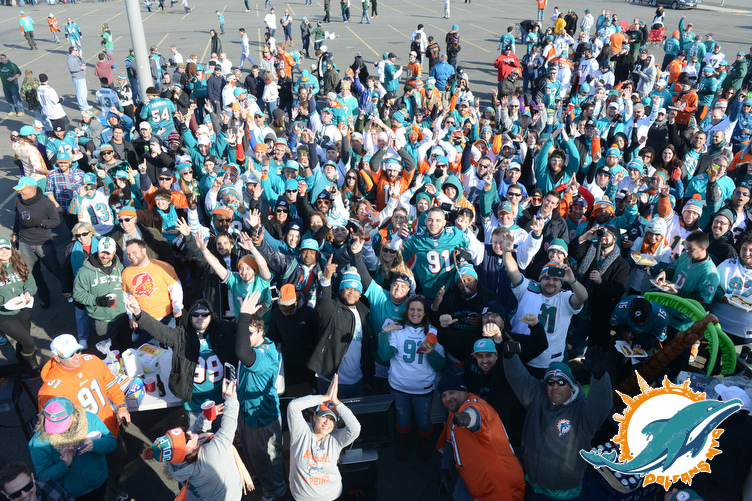 A ton of Dolphins Tweeted thank you messages to the crowd including several of them mentioning Dolfans NYC by name. We should have a list of all those Tweets on the blog tomorrow or whenever Alex gets a chance to do the post. So check out all the photos I shot at the tailgate below and both MiamiDolphins.com and our crack team of video reporters were on hand so there should be some pretty cool videos coming soon! I also will be posting these pictures to our Facebook group so tag yourselves in them! Phins up!